According to the World Health Organization’s Global Report Status Report on Road Safety 2015, more than 1.2 million people die every year on the roads around the world, most of them living in poor countries. And most of these traffic deaths are predictable and could be prevented with relative ease, with proper policies (e.g., speed reduction in urban areas) and greater use of public transportation (WHO, 2015). Take Brazil, for instance: despite the recent adoption of a series of measures to improve road safety, it registered more than 46,000 deaths due to traffic accidents in 2013 (23.4 per 100,000 inhabitants), the third highest death rate in the Americas, after the Dominican Republic (29.3) and Belize (24.4). Young male drivers are notoriously exposed to high risks of traffic accidents (Murillo-Zamora 2017), and more than 75% of victims belong to this category (World Health Organization 2013). Incidentally, this means that, beyond the moral suffering, there is also a high economic cost to pay: individuals who are in their most productive years, even when they do not lose their lives, may be seriously injured, and sometimes permanently disabled. Belonging to a low socio-economic class is another factor that increases the traffic accident risk (Malta et al 2016). And then, of course, there is alcohol consumption: most traffic accidents are linked to the presence of alcohol in the driver’s blood (Adura, Jorge, 2013; WHO, 2015). Drinking and driving is associated, among other things, with dangerous behaviors such as speeding and non-use of seat belts. Only 49% of countries around the world have national laws that set a legal blood alcohol limit for drivers, Brazil being among them (with a maximum allowed of 0.05g/dl). Although the proportion of adult drunk drivers is tending to decrease, this bad habit is still frequent. 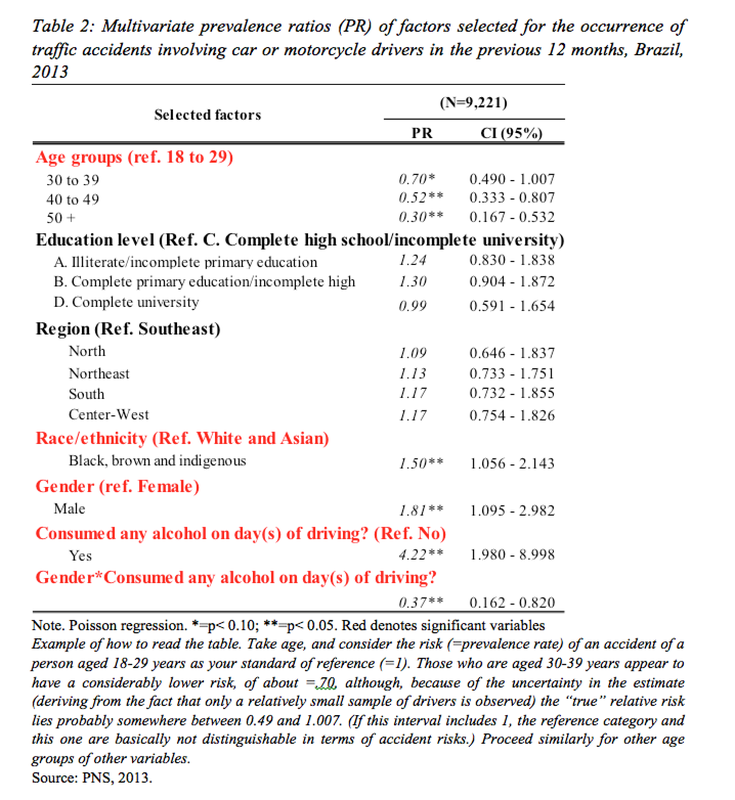 Using cross-sectional data, we estimated the factors more closely associated with traffic accidents in Brazil in 2013. Our data come from the National Health Survey (PNS), conducted by the Brazilian Census Bureau (IBGE). PNS is a household survey of complex sample design focusing on the health situation and lifestyles of the Brazilian population (Damacena et al., 2015). 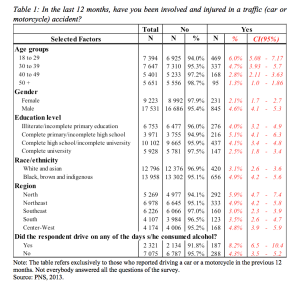 In the 2013 round, 26,754 car or motorcycle drivers aged 18 and over where interviewed, of whom 1,076 reported having had a traffic accident with bodily injury in the 12 months preceding the interview. Some descriptive statistics are reported in Table 1. Among those aged 18-29, approximately 6% reported being involved in a traffic accident in which they suffered personal injury. This percentage decreases with age, down to only 1.3% among those aged 50 and over. 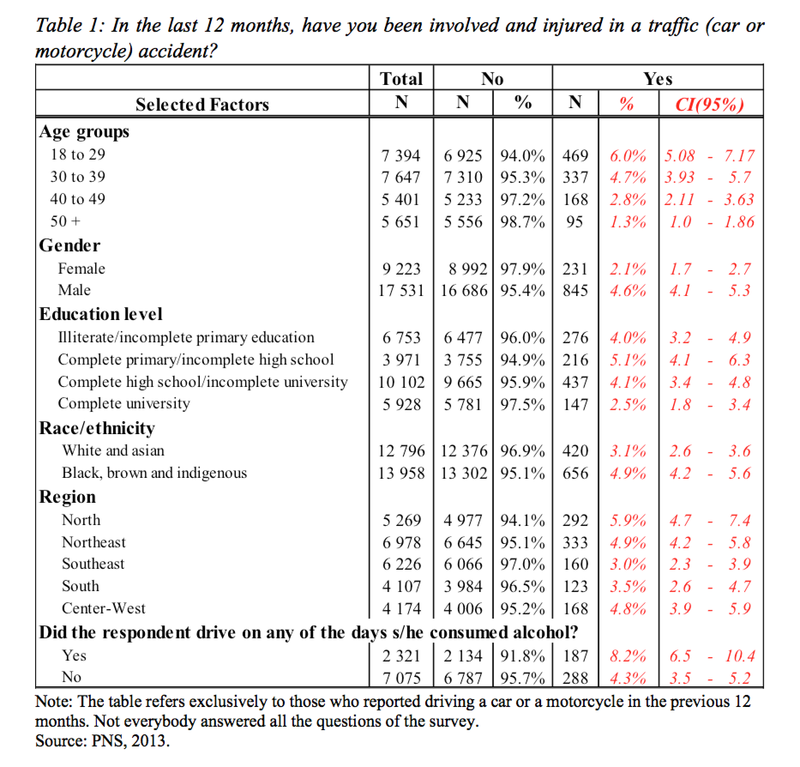 Road traffic accidents are more frequent among men than among women (4.6 vs. 2.1%), among people with low education (4-5%) than among those with a university degree (2.5%), among non-whites than among whites or Asians (4.9 vs. 3.1%), and among those who live in the North Region¹ (almost 6%). Not surprisingly, those who report driving on the days when they consume alcohol have more frequent accidents than those who do not (8% vs. 4%). Putting all of these variables together leads to the unsurprising results of Table 2, which confirm those already seen in the descriptive Table, except that, because of collinearity, some of the variables become non-significant. However, both sets of results should be taken with caution. They are in line with previous studies (Vaca, Romano and Fell, 2014), but not all the variables are defined as precisely as one would wish. For instance, “drinking and driving in the same day” does not refer to a precise period, whereas the dependent variable does (occurrence/non-occurrence of traffic accident in the 12 months prior to the interview); it is not clear whether drinking precedes driving or vice-versa, and how much drinking (and driving, for that matter) is implied; fatal injuries are, by definition, omitted from the picture, etc. Overall, however, the situation remains worrying, and much remains to be done, including the collection of more refined and more timely statistics to better understand and combat one of the scourges of modern societies, of emerging ones in particular: road traffic accidents. ADURA, F. E.; JORGE, M. H. P de M. Álcool e direção veicular. Revista USP, n. 96, p. 23-36, 2013. 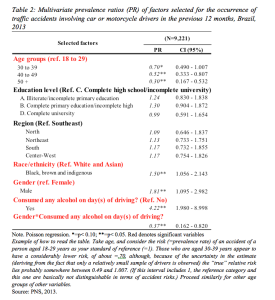 ANDRADE, S. S.; MELLO-JORGE, M. H. Mortality and potential years of life lost by road traffic injuries in Brazil, 2013. Revista de Saúde Pública, v. 50, out. 2016. DAMACENA G. N. et al. O processo de desenvolvimento da Pesquisa Nacional de Saúde no Brasil, 2013. Epidemiologia e Serviços de Saúde; v.24, n.2, p. 197-206, 2015. MALTA, D.C. et al. Lesões no trânsito e uso de equipamento de proteção na população brasileira, segundo estudo de base populacional. Revista Ciência & Saúde Coletiva; v.21, n.2, p. 399-410, 2016. MURILLO-ZAMORA E. et al. Expected years of life lost through road traffic injuries in Mexico. Global Health Action. v.10, n.1, 2017. OLIVEIRA, N.L.B. de; SOUSA, R.M.C. de. Fatores associados ao óbito de motociclistas nas ocorrências de trânsito. Revista da Escola de Enfermagem da USP; v.46, n.6, p. 1379-1386, 2012. VACA, F.E. ; ROMANO, E.; FELL, J.C. Female drivers increasingly involved in impaired driving crashes: actions to ameliorate the risk. Academic Emergency Medicine. v.21, n.12, p.1485-92, 2014.
WHO – World Health Organization. Global status report on road safety 2015. Geneve: 2015.
WHO – World Health Organization. Global status report on road safety 2013: supporting a decade of action. Geneve, 2013. ¹In Brazil, North and Northeast are the least developed regions. In the North Region, where geographical conditions give special importance to river transportation, roads are generally unsafe and poorly maintained.